Blazing Hot Wok: Lemongrass, You Have Met Your Match! Lemongrass, You Have Met Your Match! I'm feeling pretty clever and proud of myself right now. I've very recently discovered that lemongrass can be grated to a fine texture using my Microplane grater (second best tool ever, after this!). Please don't rain on my parade and tell me someone else already figured this out. I'm sure plenty of people have. It's probably all over the Internet. Just humor me and allow me the few minutes of satisfaction. If you are familiar with lemongrass, you know how fibrous and unpalatable it is if not broken down completely. Sure, I could throw it into my food processor and run that bad boy for 5 minutes. That's not always practical though. My processor has a large capacity (because bigger IS better, right? ), and unless I'm processing at least a couple cups of anything, it becomes a tedious job of pulsing and scraping down the sides. 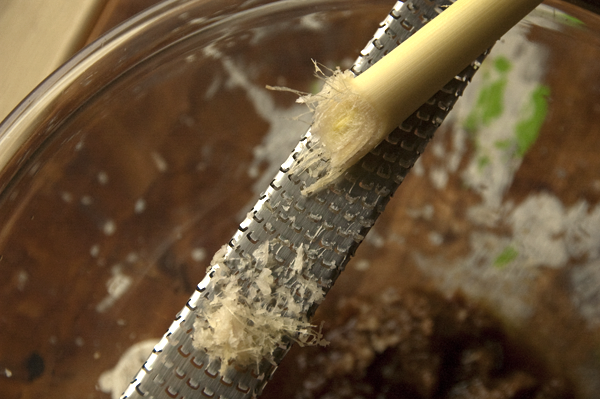 Even after several minutes the processor can only finely chop the lemongrass. It doesn't break it down to a pulpy mash. The best way to achieve a pulpy mash is to slice it super thin, then pound the heck out of it in a mortar. This takes about 20 minutes, sometimes more. Booooring! Exhausting too. But with the Microplane, it is so easy— too easy, really— it feels like cheating. The texture is perfect if you're looking to make your own curry paste or rub for meat, and it only takes about 2 minutes! Watch out, galangal! You're next!